Mohamed Kuno has several aliases but is best known as Mohamed Dulyadin, which means ambidextrous in the Somali language but also as uses the name Gamadhere. His exact age is not known but is thought to be in mid-30s. Some sources named his associates as Adam Kuso, Khalid Dheere and Mohamud Taro. “He commands the militia along the border and is responsible for cross-border incursions in the country. In the recent past, he has intensified attacks in northern Kenya and the Coast region, particularly Garissa, Mandera and Lamu,” says the Governement statement. Mohamed Kuno has been on the run since 12/2014 last year, when he was identified as the Shabaab commander who oversaw the killing of 58 non-Muslim quarry worker Kenyans in Mandera. Kuno is a Kenyan-Somali and was a headmaster at a madrassa, or Islamic school, in Garissa, Kenya until 2007. He worked for Al-Haramain Foundation between 1993 and 1995 before the institution was closed. At the time, Mohamed Kuno was known as Sheikh Mahamad. He later became a teacher and principal at Madrasa Najah in Garissa from 1997 to 2000, where his extremist tendencies became more manifested. But then he crossed the border into Somalia to join the Council of Islamic Courts – CIC . 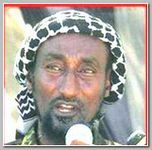 When the CIC collapsed he joined the militant group Hizbul Islam, which in 2010 merged with al-Shabab. A BBC Somali service reporter says that Mohamed Kuno is well-known as a hardliner in Somalia and is one of al-Shabab’s leading operatives in the southern Jubaland region, which shares a long border with Kenya. He is alleged to have been behind several attacks on Kenyan soldiers who are fighting al-Shabab in Jubaland. He is also blamed for attacks on Kenyan civilians in Kenya itself and the prime suspect in masterminding the Garissa University Carnage, on 04/02/2015. Mohamed Kuno has been killed on Wednesday 06/01/2016. Regional forces in Somalia said he was one of 16 people killed in an overnight raid on their convoy in Kismayo, a port city in southern Somalia. 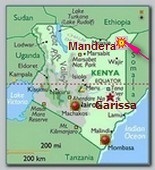 Four of those who died were reportedly senior members of the al-Shabab Islamist militant group. ** Few hours later , on Wednesday 01/06/2016 midday, Gunmen have stormed again, probably as a response, the Ambassador Hotel on Maka al-Mukarama street after setting off a car bomb at the gates outside, witnesses said. Politicians and government officials were believed to be staying at the hotel at the time. The al-Shabab militant group was quick to say it was behind the attack, which intelligence officials say is now over, about 40 people were injured & 18 killed in the attack ..